FishEaters Traditional Catholic Forums - Anyone Know Where The Largest Cross on the Earth Is Located? FishEaters Traditional Catholic Forums > Church > Catholicism > Anyone Know Where The Largest Cross on the Earth Is Located? Full Version: Anyone Know Where The Largest Cross on the Earth Is Located? Anyone Know Where The Largest Cross on the Earth Is Located? How about where the first Marian Shrine in America was built (in 1620)? How about where the first Mass was said in America? You May Be Surprised, they are located within a few yards of each other. I was pleasantly surprised and I live only 45 miles away and I took some photos of the area. BTW: These photos were taken before Hurricane Matthew ravaged the area. There is a lot of reconstruction going on there. The Cross survived intact, but the trees and some of the buildings were damaged. The Cathedral, some blocks away and the Castle of St. Augustine (1500s) were damaged, but not heavily. Most of the damages was from water intrusion and at the site, near the coast, it was flooding from tidal surge. The Spanish settled here and set up the City of St. Augustine some 75 years before the city of Santa Fe. Both vie for the 'Oldest City', but St. Augustine is certainly the older of the two. I thought the millennium Cross in Macedonia was the worlds tallest cross? Either way, it's great to have such great points of history so close. Field review by the editors. The plaque at the base of the world's tallest cross, which is 208 feet high, says that it "marks the approximate site where in 1565 the cross of Christianity was first permanently planted in what is now the United States." That's right -- Jesus arrived in America here first, over a half-century before the Pilgrims even touched their toes to Plymouth Rock. "The Great Cross" (as it's known) was erected in 1966 to mark the 400th anniversary of that momentous day. It's built of 70 tons of stainless steel plates, packed with concrete in its lower third to prevent toppling by hurricanes. It's part of the Shrine of Our Lady of La Leche, and its height was designed so that everyone near St. Augustine could see it, and be reminded "of the religious beginning of our nation," according to the plaque. One problem with The Great Cross is that it's built on a point of land jutting into Matanzas Bay. This makes its greatness difficult to appreciate from the parking lot, where it looks like just another steeple topper in the distance. 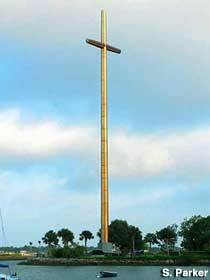 It was the first of America's giant crosses, and it's still loftier than all that have followed it. But it's spindly thin, while more recent heaven-scratching crosses have been built beefy, and right next to freeways so that passers-by can easily be awed. The Great Cross is illuminated by powerful spotlights at night, eliminating the need for a blinking red light on top, a secular law that has reportedly kept all subsequent tall crosses, mindful of their dignity, under 200 feet.